Late last year, I told you about the work we're doing to make technical information available on the MOT testing service. 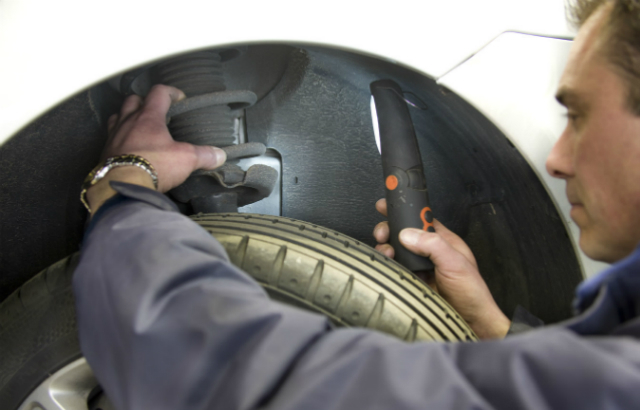 Since then, we’ve been looking at your feedback and thinking about what technical advice for vehicles we could add to the MOT testing service. We've now developed this feature and have added it to the service. We want to make sure that this information helps you test vehicles safely and correctly. It’s important that during a test you’re safe and that you don’t accidentally damage the vehicle. We also want to give you all the help you need to make the correct decision. This first version has advice on how to test around 20% of vehicles. But the way we've built this feature means that we can add to it quickly and easily. So, we’ll regularly update it with more information as we get it. If you’re testing a vehicle and see the below banner, that means there’s technical information on the testing service to help you. Once you click the link you’ll be presented with any information we have for the vehicle. You can also print it if you need to. Following your feedback, we’re still looking at the possibility of you being able to the add technical information that you know. I still think this is a great idea, but we need to look at how this would work and how we could make sure that the information added is correct. In the meantime, if you have any suggestions on what we need to do to improve this feature then let us know in the comments below. So with the new special notice that has come out in regards to dpv. That now makes defender 110's dpv class 4 if no unladen weight is supplied. Previously vosa said to do these as a class 7. Anyone from dvsa disagree with this?? Can you tell me how you have worked the weights out for motorcycles. You are over 100kg above what the known weight is on most bikes or are you guessing 100kg as rider weight ? Still seems to be a lot of vehicles with no brake weights or is it just me. All the weights appear to back for me, but I have noticed on the info page for the vehicle, it does say sometimes brake weight unknown, but when you print of the mot inspection sheet the vehicle weight is there. Why cant i scroll down the page with the cursor roller anymore. I can do in on the mot blog but not on any mot page screen. It makes it so much quicker being able to do this, please change it back!!!!!!!! It's a good system to have due the electronics now fitted, but in the example shown, it still does not tell you if you can roller test it ! Surely that's one of the most important factors to know. A lot of you have commented about problems you experienced with the testing service yesterday. We’ve been working on this and it’s now fixed. You shouldn’t experience any further problems at this time. Please check the MOT testing service status page for further information. Thanks for the update Chris, but I am still having problems logging in, anyone else ? It always chucks out my password/username on the 1st attempt every time I try to log into the system. Its the same for our other testers as well. What happened to using Google, now you've changed to using explorer we're unable to print MOT TEST LOGS. and it does print it just gives us the Reg number not like before. We like to check that all our MOT's are booked and paid for. System update to improve service last, system plays up today !!! when is the jumping back to the home screen going to be sorted? taking me 20 mins to log off a car? About time they sorted home screen out. Enter user ID and password 4 times every MOT. It's a raging joke. The system is as bad as ever. One step forward & two back. Why do we have to wait until the 12th to sort it out?? Every result I log I am having to do two or three times. STILL having issues when entering advisory items and going from screen to screen, system is throwing me out and asking me again for security code ? Still having problems entering data, keeps jumping to different pages or error messages. Same as last week !!!! When will be sorted? I know you guys are working on it, any news on whats happening ? this morning its a nightmare , every time I go to either put in a defect or an advise it chucks me back out to the home screen or asks for my pin number again. I was looking at the MOT tester annual assessment sample questions and thought that it would be a good idea to have a prominent button on the home page ie. in between the home page logo and the start mot test button "20 second knowledge test" that would bring up a random sample question with an answer.If you tick the right answer then it dissapears straight away or after 20 seconds you get the answer and it dissapears , not a test or anyone counting just for information towards your CPD, the button could go green when there is a new question to be answered. Not only have some of the brake weights not been added but some that are there are totally wrong ive just tested a 13 plate 1.0l eco focus with a b/weight of 1900kg when on our chart its only 1340kg. It failed it till I checked it. when entering rfr and advisory items,as you drag the cursor down it can change the location from nearside to offside etc. If you fail to notice it at the review screen it can become quite an issue. With v.i.n plate info being easily accessible, a hand held scanner could be used as part of the mot log in process. Scanning the vehicle vinplate will validate the vehicle being tested & also cause a pop-up of v.s.information to be displayed. Barcode display style i.d from manufacturer of vehicles could be also be accessed to confirm vehicle build spec, again by scanning. good to see it back but interested in some of the other comments hope they fix the problems with entering results details quickly . Great to see Vsi info again. Good idea, but does not work on I pad,logs me out when I use it,and what has happened to brake test weights, just as you iron out problems,it seems you replace them with new ones, Please sort it. Anybody else having issues when you log back on to put results in ,that it keeps kicking you back to the start test screen ( not all the time ) . It's happened to me loads since the last improvement , twice when I am about to print off certificate it kicks me out and I have to issue a duplicate due to loosing the end page also when you are putting brake readings in it also puts me back to the start test page ? Bloody anouying when you have a full day of tests and it makes more work for yourself . Yep, frustrating just about covers it. Took me 20 minutes to pass a vehicle the other day, and like you had to print a duplicate to get the certificate. Still having problems when putting test results and brake weights missing. Great to get tips on testing with the ever expanding model range with crazy electronics and esp eps abs trc vsc dsc start stop... no doubt new cars have far more specific ways of testing to ensure damage is prevented and a thorough test can be performed. I still strongly believe electronic parking brake is a stupid, pointless and dangerous idea that should never been allowed to be fitted to a road vehicle. Good idea but after completing the test found I hadn't actualy logged on to the test! My fault I'm sure. 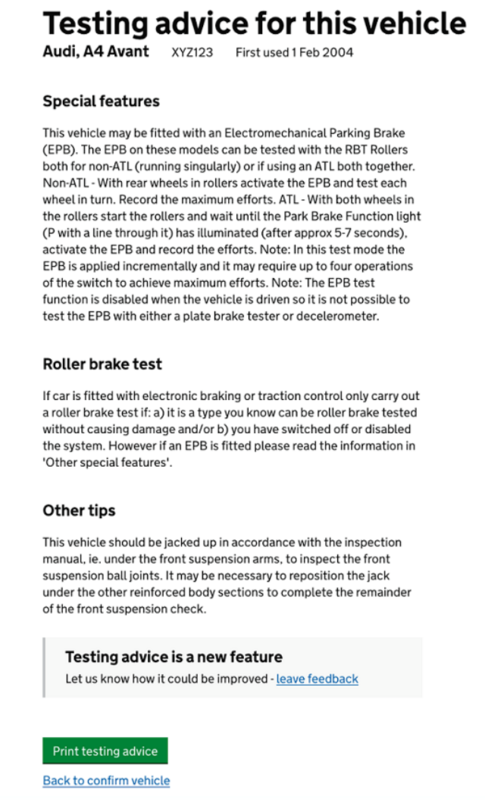 Lots of you have commented to point out that some brake test weight information is missing and that you have experienced some issues when registering and entering results. We are aware of these issues and working to address them. For more information, please check out the MOT testing service status page where we have provided a note for testers. Great on the right track. good to see positive steps and the little things that help the job work both ways. small steps big strides. hope they do the same with the hgv manual to clarify abs and type approval variations. working together with NT's will only help us do our jobs better. thank you dvsa for listening. hope this is a sign of whats to come in the future. The VSI as we knew it as before was a great little extra aid when testing vehicles; so much good information was lost when the system changed over. I personally welcome all forms of information and assistance.